I really love a good trend now and again. wishing I had legs for days. but they came in chetah print!! I also am a sucker for anything animal print. How you do you like wear the culotte trend?! This look is kinda awesome!! You really rock those. I love the culotte trend, but sadly can't pull it off. You are killing it in them though and I LOVE the leopard print! Thanks lady I was not feeling them for sure but how could you not love the leopard?! I have seen culottes around lately & I didn't like them until now. I absolutely love this cheetah print & you styled them to the T! Love this look. Those shoes are killer! You look fantastic girl! Stunning look! Very urban chic! Those shoes are so ferocious! Oh Kari your comment is great! I loved your last post! You sure have been making the boyfriend very happy! We love your recipes! You look great in this outfit . I really don't know if I can wear those , I fe they are not my style . Girllll you could do rock these! You would be surprised how easy it is! Thanks lady! Sometimes you have a good hair day! In love with the skirt! Perfect statement piece to style! Rock and chic, you are super with this culotte!!! head to toe amazing!!! love the bag and those culottes are insane!!! Great outfit! Loving that cheetah print on you! What a fun look, love the cheetah! Love your printed skirt, you look so chic! 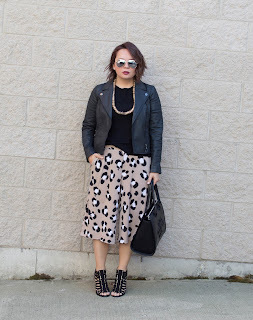 You are worrrrrrrking those cheetah culottes, lady! Those pants are so much fun gurrrl! I feel ya girl. Culottes are a struggle to find for petite women like us. I found a decent pair at Zara's a while back, but those look great on you!